Worcestershire sauce, black pepper, salt, and mustard. Cover, and refrigerate for 2 hours. Preheat grill to high heat. Gently form the burger mixture into about 12 patties. Grill patties 5 minutes per side, or until well done. 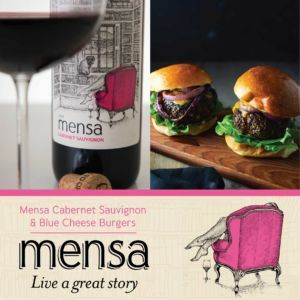 Serve on rolls with your garnish of choice and a glass of Mensa Cabernet Sauvignon! By visiting this site you agree that you are of legal drinking age in your country of residence.